Not all who wander are lost. In fact, some who wander are not lost but just exploring the terrain. Yet, when I read a journal article, I do not want to wander and wonder where the work is headed. Partly because of my busy schedule and largely because I am seeking ideas, information and even inspiration, I want to know right away what the scholarly work is about. Scholars can guide readers along a smooth reading road by paying attention to the not-so-obvious infrastructure of typical journal articles and writing their submissions with this structure in mind. What is infrastructure? The definitions of infrastructure are: “1.) the underlying base or foundation for an organization or system; 2.) the basic facilities, services and installations needed for the functioning of a community or society” (www.thefreedictionary.com). When applied to typical journal articles, the infrastructure would be all the textual signposts that are consistently used throughout a single article and across the genre of academic writing that support the smooth delivery of content and the functions of the article to persuade and inform. Examples include the structure of the abstract, and the repetition of language across the title, gap and purpose of the work. The abstract, which follows the title and list of authors, is a short, clear and condensed version of the journal article that follows it. After reading the title, readers turn to the abstract to get the summation of the article. When the abstract gives enough information, readers can decide if this article is something they want to delve into further. Even though the required abstract length is between 100 to 250 words (variance depends on the journal), what constitutes an engaging abstract is not necessarily obvious. Therefore, knowing the basic abstract infrastructure makes it easier to write. Some journals today, especially science journals, give writers headers for the different parts of the abstract. Nurse Education Today provides the following abstract headers for writers and readers: Background, Aim of the study, Research method used, Results, Conclusions. The “background” includes the rationale for the study and the “gap” in the literature that this work is designed to address. The “aim” (also called the purpose) of the study tells the reader what the authors have done in this study to address the gap. The “research method used” includes the type of research, the number of participants, the data collection methods and data analysis methods. The “results” briefly summarizes the key findings from conducting the study. Finally the “conclusions” deal with the significance of the work for others interested in this topic. The challenge for the writer is to limit the word length to under 250 words. A not-so-obvious infrastructure element can be found in tracing the key words found in the title, gap and purpose statement of some journal articles. Here are two examples drawn from the literature. Adapted from “Table 2.4, Content links between the title, the gap and purpose statement in journal articles.” Stevens, D. D. (2017). Write more, publish more, stress less! Five key principles for creative and productive academic writing. Sterling, VA: Stylus Publishing (Fall 2017). The last column on the right lists the key words repeated across the title, gap and purpose. I have underlined the key words to highlight the patterns and consistency of using the same words in these three text features. By using the same words, the content is more clearly linked throughout the text. The “gap” is the rhetorical move that establishes the need for the study. In article #1, there has been “no systematic review” of ESL health literacy curricula in the past; hence, there is a need for a systematic review of ESL health literacy curricula and the purpose statement identifies how the authors will fill this gap. In article #2, the authors point out that there is a shortage of information on research self-efficacy; hence, there is a need to investigate research self-efficacy in more depth to add to the current literature. By using the same words across all three key text features, the authors are making the journey smoother and more coherent for the reader. 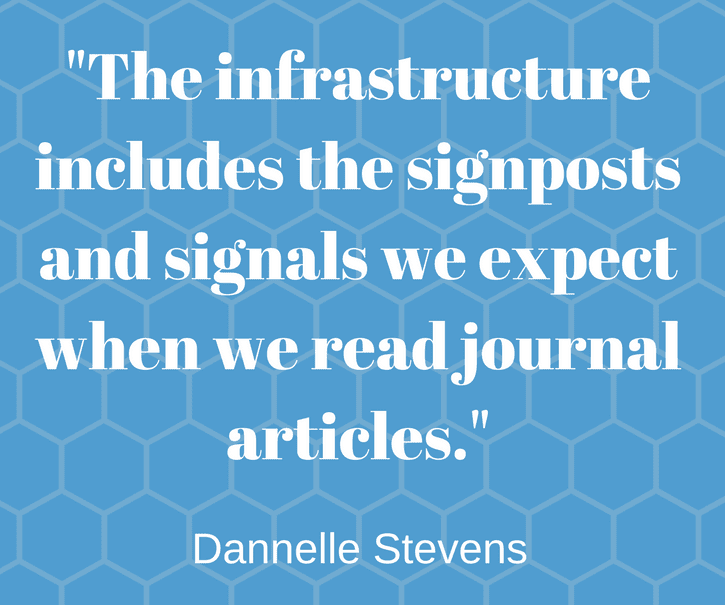 The infrastructure includes the signposts and signals we expect when we read journal articles. By paying attention to the not-so-obvious infrastructure of academic writing, writers are helping the reader focus more on the content and less on the structure; the familiar structure fades into the background. When we don’t make familiar infrastructure moves in our writing, the reader may be confused about which direction the work is heading. If the abstract does not include the results, readers will have to ferret out the results from reading the article, or the reader may give up and not read farther. Generally readers are busy people and will not want to wander and wonder where you are headed. Best to make it as easy as possible on the reader so that their journey into your work is pleasant, smooth and quickly understood.